Now, don't get me wrong, if I had a video camera, I might be. I mean, I can record video with my digital camera but I'd LOVE to have a handheld video camera and I'd probably get some videos that would embarrass my kids later in life. I have recorded them before, once during a review, and once while riding scooters in our old neighborhood. My daughter is an aspiring actress/singer and I could record her all day and I'm sure she would entertain me until her heart's content. She just loves to sing and dance and make up poems and stories. I could upload them to YouTube and have the "Ravyn Channel" and maybe she'd get discovered and make me some money! In all actuality, I wish I had a video camera, because, in the next week, my daughter will graduate the 5th grade and my son will be heading into high school. Eight grade is having a semi-formal dance next week (the same day as her graduation, go figure!) and I would be a director that day for sure! Those would be some great memories! Instead I'll shoot a short video or two with my digital camera (which is a PowerShot SD1100!) and take lots of stills. 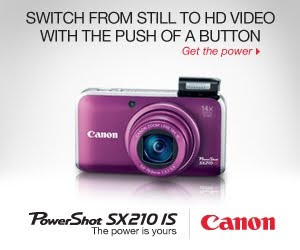 Canon has released the PowerShot SX210 IS, which combines the ability to take great photos & also shoot high definition video. Canon and JuiceBoxJungle sponsored me to write this post, and talk about what shooting video means to my family. Do you have a cute kid? Need baby formula? Take out a loan! I won a ticket to EVO Conference! Twilight Eclipse: 27 days and counting!